PRICE REDUCTION: Situated in the quiet village of Las Breñas, this detached villa has four bedrooms, two bathrooms, large kitchen spacious lounge, covered terrace, roof terrace and pool. THE ONLY FRONT LINE PROPERTY REMAINING on this new development with superb views of the ocean and the cliffs at Papagayo. Excellent Value! Enormous, semi-detached, eco-friendly villa on a large plot with private pool and roof terrace. Detached holiday villa with a tourist license. Comprising of: 4 bedrooms, 3 renovated bathrooms (2 en-suite), lounge/diner, kitchen/breakfast room, terraces, swimming pool and parking. Detached house with views of the sea. Comprising of: 4 bedrooms, 2 bathrooms, lounge/diner, kitchen, terraces, swimming pool and garage. 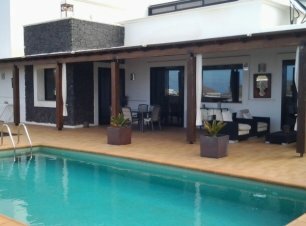 A luxury detached villa situated on a FRONT LINE COMPLEX with views to Fuerteventura and direct access to the promenade. Massive Price Reduction! A luxury detached villa situated on a FRONT LINE COMPLEX with views to Fuerteventura and direct access to the promenade. Large detached villa with fantastic views. A spacious semi-detached property, built on two levels in a large plot only a matter of a few yards from the sea. Located in a quiet position at the end of a cul-de-sac, this unique property has three independent living areas and is very close to the centre of the town. A small development of twelve luxury villas, each constructed to the very highest standards with a finish to suit the individual.